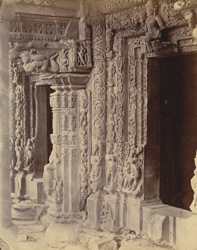 Photograph of the sculpture on the doors and pillars of the Bajramath Temple, Gyaraspur, Bhopal State taken by Joseph David Beglar between 1871 and 1872. At Gyaraspur, in Madyha Pradesh there are Hindu, Jain and Buddhist remains. The site was important to followers of these three faiths which is shown by the construction of the Hindu Maladevi temple and a Buddhist stupa here. The initial construction of the Bajra Matha Temple dates to the 10th century however the temple continued to be expanded in later eras. It is an example of the late Pratihara style. The temple's three shrines are covered by curved towers decorated with elaborate bands of mesh-like ornaments. The jambs of the doorway are richly carved as can be seen in this photograph. It has three shrines which were originally dedicated to Surya, Vishnu and Shiva but are now occupied by Jain images.